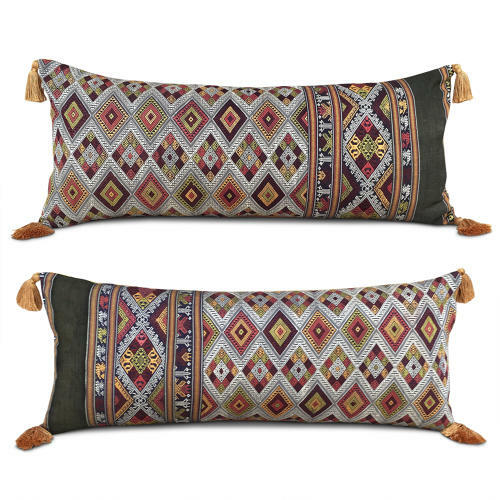 These stunning cushions are made from a vintage Laos textile that was a shawl worn across the shoulder. The exquisite weave is in cotton and silk and the colours are all natural dyes. The striking rust colour has been used both for the backs of the cushions which are velvet, and the bamboo silk tassels on the corners. These larger cushions are perfect for dressing a bed with and take up the space of 2 or more square cushions. There are two cushions made from the textile and they have zip fasteners and feather pads.